Let’s put that all together. Since “milk” (according to the FDA) is from lactating cows or goats, and almonds don’t lactate, what is normally called “almond milk” is actually an “almond beverage.” Apparently the FDA is going to crack down on making sure the all those fake “milk” products are properly identified (for anyone who actually thought that almonds lactated). It’s likely this is the result of a push from the dairy industry. In fact, legislation was introduced in 2017 to specifically limit the use of the term “milk” to just cow milk (or maybe mammal milk). It didn’t get much traction, but the dairy industry will no doubt lobby for some legislation to get pushed through at some point. So what does that have to do with soap and cosmetic labeling? It has to do with what you say on the label and how ingredients are identified in the ingredient declaration. According to the regulations, the name used to identify ingredients should be the name used in the International Cosmetic Ingredient Dictionary (except that botanical names should use the English version of the plant name, not the Latin name) 2. 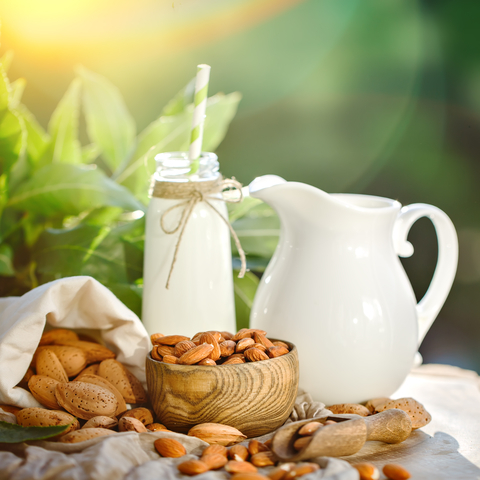 It’s unlikely that the FDA (or your local state) would come after you for incorrectly identifying your ingredient as “almond milk” in your ingredient declaration. That might change if the FDA decides the use of the term “milk” is of higher priority (or if legistration is passed which required more rigid enforcement). So if you use a nut “milk” in your cosmetic product or soap, next time you print your labels, update your packaging to correctly describe your products and list your ingredients. 1. ↑ 21 CFR 131.11o defines milk as only coming from cows. That definition is reiterated in 21 CFR 58.101(k)(1) and the next paragraph, 21 CFR 58.101(k)(2) ads essentionally the same definition for the lacteal secretion from goats. 2. ↑ This is true in the United States only. Other countries would use the Latin name only. Thanks for this update, Marie. Really helps us vegan soapers! Thanks Marie. An useful update. Marie, if we make our own almond, oat or rice “milk” then couldn’t we just list the ingredients used in making those things as part of the ingredients on the cosmetic label? As long as they are in the correct order, it seems like this should be acceptable. For example, I make almond milk for soap with almonds and water only. I already have water in my ingredient list, and so almonds would be at the end, because the amount in the “milk” would be less than any of the other ingredients, or less than 1% of the total ingredients. Coming from a Latin culture I had never heard the term “milk” for oats,rice,almonds or soy. It was always fresh rice water ,Horchata or Agia de arroz, same goes for the rest, but interesting to know we called it milk, I guess due to its whitish color. Curious if other cultures call it water or milk. You do need to list all of the individual ingredients in the product – not the commerical name of the base that you use. You should be able to get the iangredient list form your supplier. Add to the list anything that you added to the product (fragrance, color additives, etc).